The cross voting by rebel JD(S) MLAs benefitted the Congress as it party grabbed the third seat and senior leaders of the party like Oscar Fernandes and Jairam Ramesh won in Karnataka. Former IPS officer K C Ramamurthy defeated JD(S)-backed Independent candidate B M Farooq, a business person, in the third seat. In the 27 seats spread across seven states that were up for grabs today, 11 went to BJP, 6 to Congress, 7 to Samajwadi Party, 2 to BSP and one Independent. Thirty of the 57 seats in the current round of biennial elections were decided without contest last week. Former union minister and Congress heavyweight Sibal managed to defeat BJP-backed Independent candidate and socialite Preeti Mahapatra, wife of a Mumbai-based business person, without the anticipated support of BSP whose two candidates Satish Chandra Mishra and Ashok Sidharth won comfortably. In Uttar Pradesh, all the main political parties ensured victory for all their candidates despite cross voting. The results showed that BSP, which had backed Congress RS nominees in Rajasthan and Madhya Pradesh, chose not to transfer its surplus votes to any other party candidate in UP. Although Sibal got through, the 29-MLA Congress suffered a jolt with Sibal getting only 25 first preference votes despite 8-member RLD committing four votes each to Congress and SP. There were 12 candidates for 11 Rajya Sabha seats in UP and to secure a seat in Rajya Sabha, a candidate required 34 votes. Cross voting took place in today’s polling as Samajwadi Party fielded seven candidates but the seventh candidate was short of nine first-preference votes for victory. Although SP managed to ensure the victory of all its seven candidates, only three were through in the first round of counting, reflecting that the contest was close for the ruling party. Bahujan Samaj Party chose not to transfer its 12 surplus votes with it, two candidates, Mishra getting 39 votes and Sidhharth 42. The last-minute entry of Preeti Mahapatra, wife of a Mumbai-based businessman, in the fray which forced a contest, managed just 18 first preference votes and conceded defeat even when the counting in further rounds was on. In Madhya Pradesh, the results were on expected lines as BJP candidates M J Akbar and Anil Dave and Congress’ Vivek Tankha were elected even as BJP-backed Independent candidate was defeated. BJP’s bid to spoil the Congress candidate’s chances by fielding its leader Vinod Gotia as an independent candidate did not succeed. Gotia got 50 votes–48 surplus votes of BJP and two independents–against the 58 required for a win. Senior journalist M J Akbar and state BJP leader and strategist Dave polled 58 votes each, while Tankha secured 62 votes–57 from Congress, four from BSP and one independent, returning officer Bhagwandas Israni said. BSP supremo Mayawati had issued a whip to its four MLAs to vote for Tankha. Janatal Dal (Secular) suffered humiliation in Karnataka with eight of its MLAs cross voting in favor of Congress. Congress’ candidate Ramamurthy chalked up a resounding victory securing 52 votes, aided by the support of Independents and JD(S) rebel MLAs, defeating JD(S)-backed nominee B M Farooq, who managed 33 votes against the party’s strength of 40 in the Assembly. 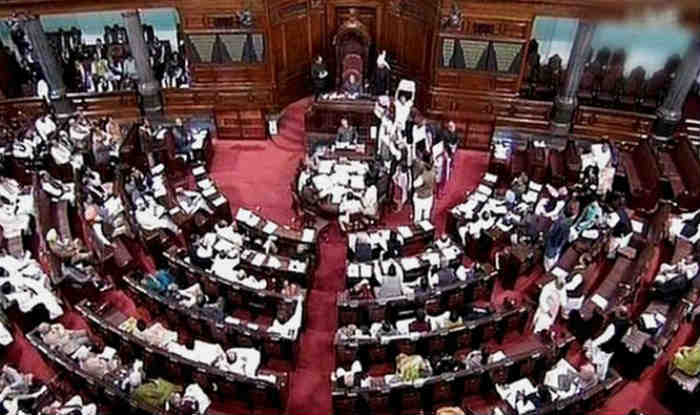 ”8 MLA’s have voted against JD(S) in today’s Rajya Sabha election in favor of Congress. Tomorrow in the party’s meeting, we are going to take action against them according to provisions of the party constitution,” JD(S) spokesman Ramesh Babu said. Rebel JD(S) MLAs, who cross-voted are Zameer Ahmed Khan, Chaluvaraya Swamy, Iqbal Ansari, Balakrishna, Ramesh Bandisiddegowda, Gopalaiah, Bheema Nayak and Akhanda Srinivas Murthy, Babu said, admitting the loss much before polls ended. Congress with 122 members was assured of two seats for Ramesh and Fernandes and with a surplus of 33 votes, the party fielded Ramamurthy. The required strength for victory was 45 votes. Nirmala Seetharaman secured 46 votes with BJP, which with 44 members was short of one vote, making up the shortfall comfortably.